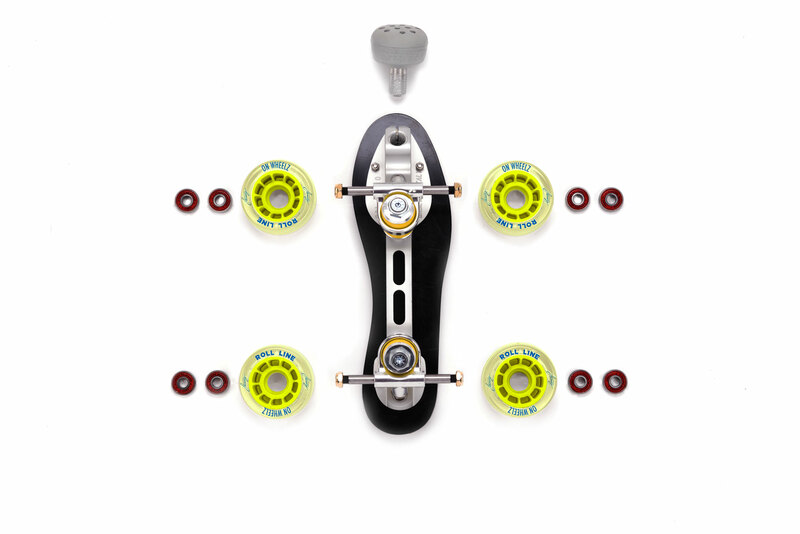 A legendary and specialized sneaker customized, an accurate and very reliable rolling part, ideal for technical and demanding skating..
Prêt-à-porter line specially developed for Capsule F.
Wheel hardness: 82A wheel with plastic injected hub, ideal for skating on all types of surfaces. An immaculate, neutral and harmless Air Force One White like a white page, blank canvas, a solicitation to create, suggested to Amedeo Abello, Flaneurz’ artistic director. The leather treatment allows impermeability of the shoe, inter alia. Three Fluo paint layers of interspersed with drying time of few hours, brightened the Nike Air Force One White. Each part of the sneaker is treated with different additives depending on the material: the "back logo", the "superior scratch logo", the AIR on the midsole, the lining and the inner leash. 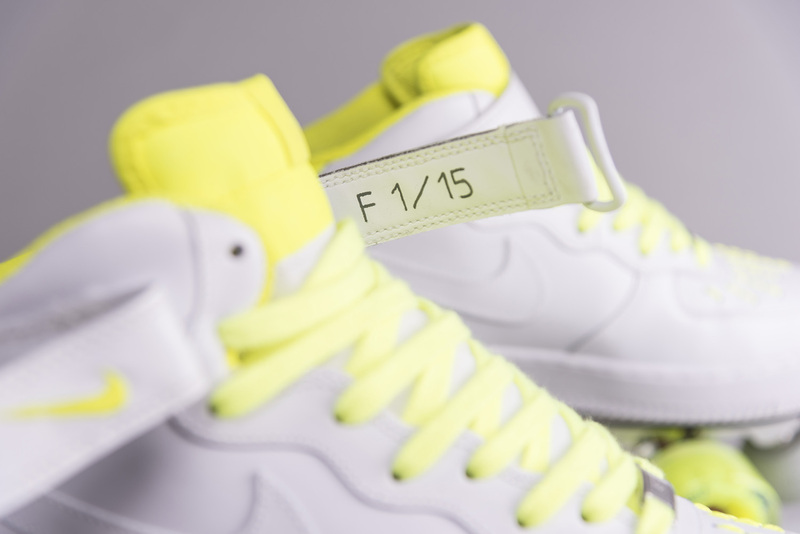 To all that is added the DMC Fluo sewn, the laces allows a continuity of the Fluo line on the upper of the shoes. Each pair of the capsule is numbered by hand by a marking "limited ed" on the inner eyelet , with sneakers special paint and is accompanied by a collector pret à porter collection. As a performance shoe, the AF1 is still used for street play as well as for professional play. Luminescence is caused by the absorption of radiation at one wavelength followed by nearly immediate reradiation usually at a different wavelength and that ceases almost at once when the incident radiation stops. “My aesthetic universe tends to minimalism, graphic research. I wanted to bring life to the Air Force One, to boost them with colored vitamin, turn them into chemical candy ... Fluo, stabilo, to highlight ... Capsule F is a joie de vivre manifesto, a big thrills shoot! Wink to the eighties, golden age of roller quad, to fluokids, fluo absorbs and re-issues the light. The flâneur will be seen, unique.”, Amedeo Abello, Flaneurz’ artistic director. Find out more on the Capsule F on our blog.